If you aren’t familiar with Heidi Swanson, Heidi Swanson’s 101 Cookbooks is the ultimate vegetarian foodblog. The photography is stunning, and recipes are seasonal and inspirational. I was looking for a sweet potato recipe that wasn’t too complicated but whose flavors would enhance turkey and her accoutrements. I found this recipe in the 101 Cookbook recipe archives; she, in turn, found the recipe in Terrance Brennan’s cookbook, Artisanal Cooking. The flavors of orange zest, vanilla and sweet potato are sublime together. The original recipe is a bit different and also includes a recipe for an Autumn Spice oil. 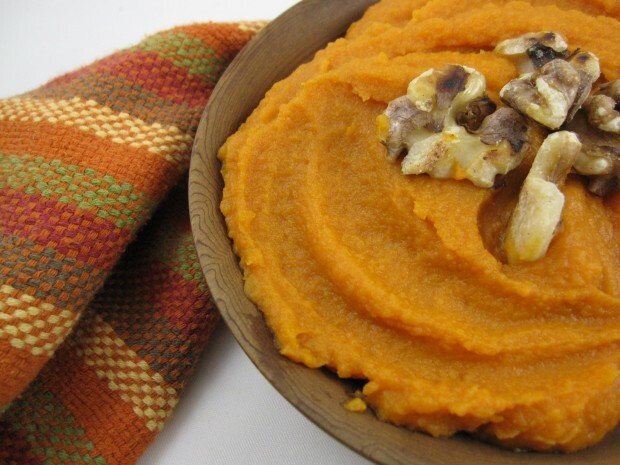 This would be a marvelous addition to the sweet potatoes, if you’ve the time. Put the potatoes on a baking sheet and bake in the oven until tender to a fork tip, about 1 hour. Remove from oven and let cool until warm enough to handle, 10 to 15 minutes. Peel and discard the skin. Put the potatoes in the bowl of a food processor fitted with the steel blade. Meanwhile, pour the cream into a 2-quart pot, add the vanilla bean and orange zest, if using, and set it over medium heat. Bring to a simmer and cook for 5 minutes. Remove from heat. Remove and discard vanilla bean. Pour the mixture over the potatoes in the processor and add the butter. Purée the potato mixture until smooth. Season with kosher salt and freshly ground pepper. Garnish with toasted walnuts, if using.